Editor's Note: An Executive in Residence at Philanthropy Northwest, Rosalie works with foundation trustees and executive staff to set up impact investing programs, and to solve investing issues. From this Front Row Seat, she sees some very good ideas. 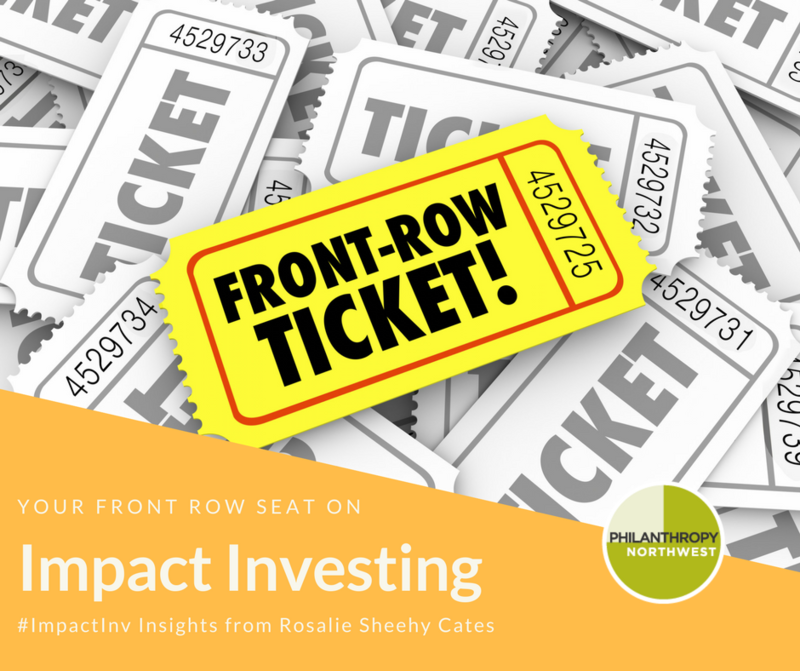 In this multi-part blog series, Rosalie shares observations and insights care of many smart and innovative foundations and financial advisors working to make impact investments in the (mostly) Pacific Northwest region. To learn more, please email Rosalie—she looks forward to hearing from you! Northwest Area Foundation has cracked an important investing nut for foundations. Let me explain. Impact investors often assume their strongest impact returns will come by way of private investments in companies. The idea is to directly fund exciting firms that create quality jobs, revitalize a neighborhood or lead a market-driven environmental solution. There are many options for foundations to make these private mission investments and earn relatively low financial returns. But as foundations open more of their endowments to mission investing, they want more market-rate mission investments. Conventional wisdom says it is tough to find these “institutional-quality” private mission investments outside of urban centers, where all the cool companies and funds are located. Northwest Area Foundation (NWAF) is challenging conventional thought. In 2014, the NWAF board asked the foundation’s Investment Director Amy Jensen to find $30 million of market-rate mission investments for its roughly $400 million endowment. To do so, she had to find funds and managers investing in companies that “advance good jobs and financial capability” in the mostly rural eight states that NWAF serves—and with good returns. From the start, Amy did not expect that her national investment consultants would find the specialized investments that NWAF sought. She anticipated placing a maximum of about $5 million with any one manager, which is smaller than the norm for the private funds and managers that her investment consultants normally see. NWAF also wanted to place at least some of their financing in small towns and rural places, outside the big cities where institution-grade funds are often engaged. So, Amy began her own research, and she turned her attention to smaller, boutique fund managers in the West and Midwest. Soon she found Stone Arch Capital in Minneapolis. Mapping the investments in their first two funds, Amy noted that Stone Arch places a lot of capital in rural communities. In fact, Stone Arch specializes in helping retiring owners sell mid-size companies, mostly in smaller communities. This caught Amy’s attention because losing companies when owners retire is a significant economic issue for the more-rural communities that NWAF serves. Amy also noted that Stone Arch’s financing had never resulted in a company leaving its home location, which is another important issue for rural communities. HCAP Partners is another smaller fund Amy found, this one overtly mission-oriented. It finances companies that improve life for low- and moderate-income people and places. Amy and the NWAF team liked how HCAP implements a blueprint for improving job quality at its companies. HCAP tracks investees’ progress toward living wages and good benefits. These are longstanding mission interests of NWAF. Amy also liked the communities HCAP serves as it extends financing to people with low income or who are women or minorities. NWAF invested $5 million in HCAP Fund 3. HCAP also led Amy to a $1.5 million direct investment in a company called Noribachi. This company produces LED lighting at a California plant, which is outside NWAF’s granting geography. “The foundation would rather stay closely aligned to mission and be less aligned on geography in order to partner with the right investors and managers. Geographic limits make partnering hard,” Amy noted. The mission investment team is not housed in the foundation’s “finance” vertical. Instead, program staff get very involved with Amy in investment research and decisions. “I have the greatest collaboration with our grant program director (Karla Miller),” Amy said. “She has met most of the fund managers and she is a great resource when our fund managers want to understand job quality strategies. It’s a fantastic collaboration,” she added. The foundation’s Investment Committee considers and approves all investments other than Program Related Investments, which go to the Program Committee. NWAF really challenges our assumption that it is hard to find quality private mission investments for smaller-than-institutional-fund amounts outside of large cities. Some of NWAF’s success is certainly attributed to having a curious, skilled investment officer on staff at the foundation—Amy and her team definitely take on the research and analysis that other foundations might outsource to a boutique impact investment advisor. But whoever does the work, NWAF shows us that the deals are there. NWAF has excellent information on its mission investing philosophy, including its track record, available on its website. Its private, market-rate mission investments are complemented by $16 million of Program Related Investments, which are low-interest loans and are not awarded as grants. The PRIs are for organizations providing capital and support to new and growing businesses, especially in American Indian communities. Front Row Seat is always interested in hearing your solutions to the myriad puzzles that impact investing presents to foundations. Contact me, and let’s talk!